Pharmaceutical wastewater streams can be difficult to treat with conventional physical/chemical and biological treatment systems. High chemical oxygen demand (COD), variable strength waste streams, and shock loads are just a few of the conditions that limit the effectiveness of these conventional systems. Physical/chemical systems are a common method of treating pharmaceutical wastewater; however, system results are limited due to high sludge production and relatively low efficiency of dissolved COD removal. Biological aerobic treatment systems are also used extensively, often with limited success due to the final clarification step. The clarifiers are susceptible to sludge bulking and variations in total dissolved solids, often associated with batch process production, which can cause destabilization of bacterial floc formation, with a consequential loss of biomass in the final effluent. These systems require constant operator attention to adjust chemical dosing for the daily, even hourly changes in influent flow. 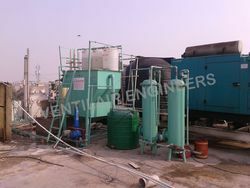 Ventilair Engineers have succesfully install pharmaceutical effluent treatment plant in INDIA & other country. We are providing Pathological Lab ETP, these Pathological Lab Effluent Treatment Plant are very efficient and customized as per client requirement. The physicochemical wastewater treatment techniques are used as pre-treatment, final treatment as well as specific treatment for wastewater reuse as process water. We have a huge range for effluent treatment these are ETP for Vehicle Washing (water recycling plant)Turnkey Etp, Etp for Rice Mill, Etp for Small Food Industries, Etp for Dry-Clean Industries Etp for Textile Industries, Etp for Food industries Etp for Oily Water, Etp for Laundry, Water, ETP, Industrial Etp, ETP for various Industries, Packaged ETP, Etp for Print Industry, ETP for Seeds Rinsing, Etp for Rail Coach, ETP for Iron Removal, ETP Plant For Automobile, Small Scale ETP, ETP For Oils And Grease Removal, Complex Organic Chemicals Industry Etp, Etp For Acids And Alkalis, ETP for Dying Industry, ETP for Electroplating Plant, Etp for Hospital, Etp for Paper Industry, Physico- Chemical Process Of WTP Waste Water treatment Recycle Machine, Pharmaceutical and personal care industries and Drug manufacturing units contain various solvents, ingredients. Wastewater Treatment Plant For Construction (MBBR Process, Etp for Pulp And Paper Industry, ETP For Fabric Factory, Etp for Construction Site.